Easily cleans wheel discs from contaminations and brightens them. Protects against corrosion. Applied for cleaning of wheel discs of all types, including light-weight aluminum alloys. Quickly cleans discs from hard-to-remove contaminations, which are caused by break operation. 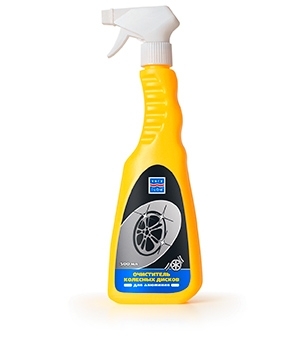 Spray onto the surface of cold wheel discs, which is to be cleaned, wash with large amount of water in 10-15 seconds. After the cleaning, it is recommended to treat tire casings with VERYLUBE Conditioner of rubber and plastic. Please, check the compound effect on a small area of the disc before application. Do not apply to brake system, steering system and mounting assemblies. It is not recommended to apply the product to chromium-plated wheel discs. In this case use Wheel disc purifier (for chromium).